visit the V coins web site at www.vcoins.com for a great list of coins for sale. The town of Carrhae was the site for the battle between the Parthians under Orodes II and Romans under Marcus Licinius Crassus in 53 BC. This battle was the most celebrated episode of all Parthian history, according to a chronicler of the events. This historian’s name is unknown, but the events were apparently recorded impartially and in ways to show what was happening on both sides. The Romans were successfully expanding the boundaries of the Republic and kept their eyes on the East. Lucius Licinius Lucullus invaded the Armenian Kingdom to Tigranocerta, its capital, in 69 BC, during the Third Mithradatic War. Lucullus appealed to the Parthian king, Arsaces XVI, to remain neutral as the Roman pursued Tigranes II, King of Armenia, establishing the Euphrates River as the boundary to Parthia. Arsaces agreed and Tigranes fled to the old Armenian capital of Artaxata. It was there Tigranes reversed the tide and dealt a heavy defeat to Lucullus in 68 BC. The Romans retreated, the troops mutinied and Pompey the Great was sent to relieve Lucullus. Mithradates and Tigranes took the opportunity to rebuild and strengthen their armies, but Tigranes was too weakened and Armenia became a client state of Rome when Pompey invaded. The Romans pursued Mithradates, putting Pontus and the Cimmerian Bosporus under control and finally defeated Mithradates in 63 BC. Pompey then returned to Rome. In 65 BC, Crassus was elected censor and financially support Julius Caesar during his pursuit of becoming Pontifex Maximus. In 60/59 BC, Crassus, Julius Caesar and Pompey would join forces as the First Triumvirate. 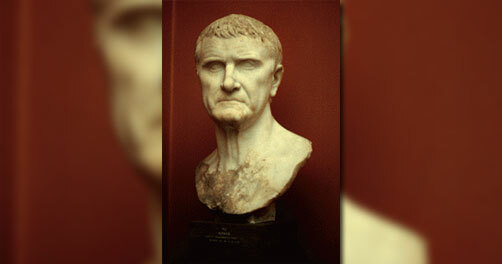 In 55 BC, Crassus was again elected consul and was appointed to Syria as his province. Crassus, one of the wealthiest men to have ever lived, wanted to outdo the successes Caesar and Pompey had in the East in the past, and decided to invade Parthia. Artavazdes II, the King of Armenia, offered Crassus 40,000 troops if he would travel through Armenia on the way to battle, but Crassus refused, deciding on a more direct route across the Euphrates. The Romans vastly outnumbered the Parthians, however, the Parthians were rumored to have a powerful archery force, making the Roman soldiers hesitant, on top of being weary from the long travel. On May 6, 53 BC, Crassus and his armies arrived at the Balicha River, near Carrhae. The officers advised rest, but Crassus only allowed for a quick meal and pushed onward. Scouts returned to camp with news that the Parthians arrived. Crassus arranged the troops in a hollow square, with cavalry alongside each battalion. The Romans were still getting into formation when the Parthians, under Surena, struck – only three of the four sides of the square assembled. Cassius commanded the left wing, Crassus the center and his son, Publius, the right. The Parthians had around 10,000 total troops – 1000 heavy cavalry and 9000 archers. This was a combination the Romans were not prepared to handle as they were used to hand to hand combat. The Parthian archers were equipped with compound bows and knew they would be overcome if they didn’t keep their archers well-supplied. 1000 camels, laden with arrows, were in the back, giving the Parthians a near unlimited supply. The Parthians used the terrain to their advantage as well. They approached the Romans from on top of the hills, charged in with the heavy cavalry, inflicted quick damage, then retreated while continuing to fire arrows. This hit and run technique with firing arrows forward and backward became known as the Parthian Shot. Crassus was worried about being outflanked and ordered Publius to pursue, the Parthians pulling that whole flank away from the rest of the troops by pretending to flee. Once enough distance was between Crassus and Publius, the Parthians turned around and shot most of the soldiers. Of the 5,500 troops in that flank, only 500 survived and were taken prisoner. Publius and his officers were killed or committed suicide. Crassus began to pursue, but retreated when he encountered Parthians with his son’s head on a lance. The Parthians continued to shoot at the Romans until nightfall. The Parthians didn’t give the Romans any time to rest or recover and camped near them. Crassus and his legates, Vargunteius, Octavius and Cassius, fled north toward Carrhae with the troops during nightfall, leaving the dead and wounded behind. Vargunteius got lost and Surena and his troops annihilated him and his four battalions on May 7. Crassus and the rest arrived at Carrhae while the Parthians spent the rest of the day taking the wounded prisoner. On May 8, Surena and his troops surrounded Carrhae. Realizing there was no way to receive help, the Romans fled to Sinnaca, but Cassius and his 500 men deserted. Crassus and Octavius arrived at the town and Surena offered Crassus peace to reestablish ties to Rome. Crassus accepted and asked the treaty to be signed on the Euphrates, as had been in the past. Surena gave Crassus a horse, but Octavius misunderstood what was going on and slew the Parthian helping Crassus mount it. A fight broke out and Crassus was beheaded and his hands cut off for breaking a pact. The head and hands were sent to Orodes II. Of the 42,000 Roman troops on the campaign, 10,000 eventually arrived in Syria with Cassius, 10,000 were taken prisoner and the rest killed in combat.